SuperUser: done with LicenseKey babbling! Download a mirror copy of 4SM website ==> 4SM HELP services: work offline! is a great free software. to have/use the PCI Geomatica software to use 4SM. Your own favorite image processing software will do, along with Openev. Openev is available for Windows and for Linux. Ensure your computer has AcceleratedX or the screen hangs/freezes! Image format: 4SM uses the image format of PCI Geomatica database.pix, whether BAND or FILE interleaving. Openev can read quite a great number of image formats, in particular TIFF, PCI, ENVI, ERDAS, ILLWIS, ERMapper, IDRISI. OpenEV uses GDAL (Geospatial Data Abstraction Library) for accessing raster files, so any file formats supported by GDAL should be supported by OpenEV. The original, and authoritative list of GDAL Supported Formats should be checked for a current format list, and details of each format. 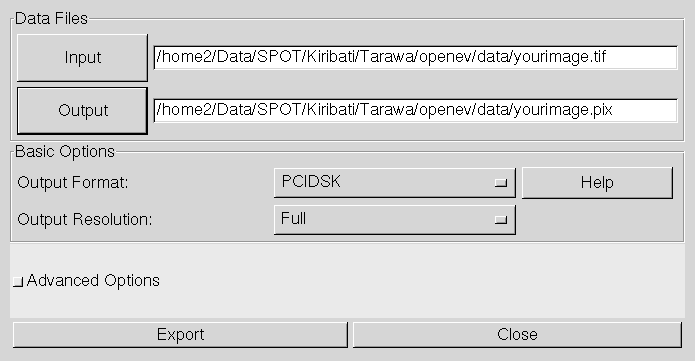 Openev can export from any of these formats to PCIDSK database.pix. 4SM then reads from and writes to database.pix. 4SM now uses only Openev for display of the image. The mask_mSE is now entirely prepared using 4SM. Then when finished, Openev is used to write out the database.pix preferably to ERDAS.lan or TIFF. This shall be the start of the first 4SM tutorial. yourimage.tif is no georeferenced: do not try to overlay shapefiles provided yet! chmod: check that both are made executable: "chmod a+rwx 4SM tarawa-subset.sh"
-dB/tarawa-subset/27_1_0_0/3_1/650_600/714.5_162.54/1_1 with 27 8U channels, followed by one 16S channel, 650 rows and 600 lines. ==> check it out by displaying with Openev.